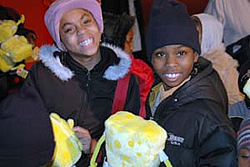 Homeless in New York - The New York City Children's Holiday Party, Inc.
Over the last 16 years, we have seen the number of homeless in New York constantly changing. Although valiant efforts are made to reduce this number and afford people housing, events such as Hurricanes Irene and Sandy and the job market make this number fluctuate tremendously. As of the summer of 2018, over 22,000 children slept in shelters nightly — with levels at the highest rate since the Great Depression. Many of these children and their families had lived in regular housing until events such as a parent’s job loss or a disaster forced them to leave their homes. Without the familiar celebrations, the holidays can be a painful reminder to these children of just how dramatically different their lives are now from other kids. Our organization’s goal is to ensure the holidays are a happy time for these children by treating them to a festive experience, a party unlike any they’ve ever experienced before. The Department of Homeless Services (DHS) of New York City is our partner in planning the New York City Children’s Holiday Party. DHS delivers temporary shelter and social services to families in more than 150 shelter facilities throughout the city. If you’re interested in helping us with our 2018 event, please email us at info@nycchp.org or call us at 917.797.0490.